DJ Meaty Paws of KALX had scheduled another Hicks with Sticks Bay Area Twang Special at KALX on Tuesday, 11/29 at 11:59 pm. 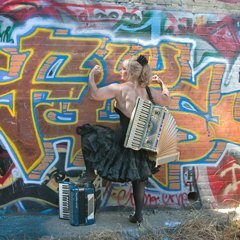 The playlist includes 2011 releases from Laura Benitez (Cottonpickers), Chris Doud (Good Luck Thrift Store Outfit), Big Lou (Those Darned Accordions), the Nearly Beloved (Matt Lax), Belle Monroe and her Brewglass Boys, Kit and the Branded Men, Dore Collier, The Real Sippin Whiskeys, Loretta Lynch, a Noe Valley Farmer’s Market compilation, Whiskey Pills Fiasco, The Midnight Trio, The Heel Draggers, Whisky Richards, Mandatory Merle, Tumbleweed Wanderers, Rock Soup Ramblers and three or four others still to be rounded up. But the Meat Man has been hobbled by an unfortunate Thanksgiving injury. Nothing terribly serious, but the show is likely to move to January. Meanwhile, here are seven CD reviews that have been culled from the herd. There’ll be more in the next post. The number one single on the Hicks with Sticks hit parade is “Talk, Talk, Talkin’ on the Phone,” from Big Lou’s CD, Big Lou’s Back, not that she ever went away. An accordion muscle pose of Big Lou’s actual, physical back is what the gag’s about. It’s no gag that the band had outgrown its beginnings as Big Lou’s Polka Casserole. After all, how many polka bands have a steel guitar (David Phillips), an electric bass (David Golea), and no tuba. The CD is delightful mix of styles starting with the sultry “Forbidden Love,” followed by an instrumental mash-up of the Israeli folk chestnut “Hava Nagila” and the Who’s “Pinball Wizard.” They call it “Who-va Nagila.” There is even a jaunty little “Blitzkrieg Bop.” This one of those rare CDs where the unlikeliest songs can find their way into one’s head three days after they’ve been played. Big Lou’s Back‘s two C/W songs are among its many strong tracks. 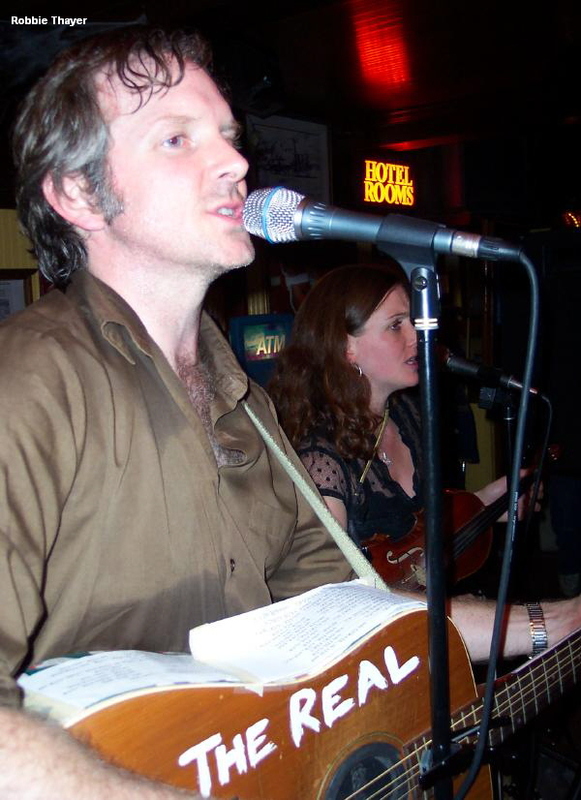 One, “Were Not the Jet Set,” is a duet that John Prine and Iris Dement put on the map. The other is “Talk, Talk, Talkin’ on the Phone,” a 21st century take on Merle Travis’ and Tex Williams’ “Smoke, Smoke, Smoke that Cigarette” which was first written, mainly, by Travis, and a hit for Williams in 1947. It was heresy to criticize smokers back then when people could, and did, smoke anywhere and everywhere, and 9 out of 10 doctors preferred Chesterfields. Big Lou’s update tackles on the ultimate 21st century intrusion: the cell phone. “There’s a special place in Hell/If you don’t put down that cell/If you keep on yack, yack, yacking on the phone.” Here’s the video! 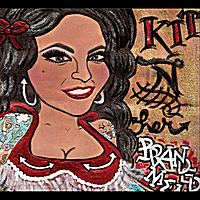 Christina “Kit” Lopez willed Kit and the Branded Men into existence and hasn’t looked back. It’s easy to forget how young she and her first band are. Now, four years down the line, they’ve put out an EP, played stages all over California, and have their first full length CD. They’ve also made a lot of friends along the way and managed to find room for quite a lot of them on the CD. Guitar hero Jinx Jones joins keyboard master Carl Sonny Leyland on “Hey Baby.” Michael Montalto (Red Meat), Mitch Polzak (Royal Deuces), Dave Zirbel (Jessie Harris Band), trumpeter Rob Dehlinger, keyboardist about town Eric Metzger, the versatile Billy “Long Head” Wilson, and songwriter Danny Santos (Sweet ‘n’ Lo’s) all gave it up for one track or another. Kit wrote most of the songs, with her musical partner Glen Earl Brown Jr. contributing lyrics to a few of them. The instrumentation is strong, as it naturally would be from hese players, and the songs themselves echo the bars of Bakersfield in days of yore. It’s good to see KBM live, particularly at their monthly shows at Speisekammer in Alameda where one never knows who might stop by to play. The essence of their live show can be see in this video montage where they were joined by with Dave Gonzales (Paladins, Stone River Boys) at this year’s Ink & Iron. The Noe Valley Farmers Market CD is a 16-track mixture of folk, old-time, bluegrass, country and pop compiled by Lucky from the band They Call Me “Lucky”. 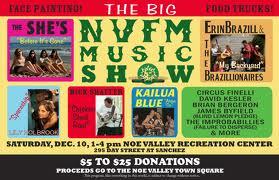 Established bands like the Shut-Ins, Bell Monroe and her Brewglass Boys, and Grizzly Peak have played the NVFM, but they are the exception. Typical are bands that are works in progress. There are bands that will do daytime, tip jar gigs without PA and where children make chalk drawings on the tarmac next to the band. Lucky wasn’t exactly shopping uptown for these tracks, which tend to be home-grown. “Nerd Love,” where Renee de la Prade sings about being turned on by guys clued into scientific naturalism, is the best of the bunch. Topics like the Big Bang, nano-technology, molecular biology and particle accelerators are what float her boat, “Clever conversation can conclude in copulation. Nerd love! Nerd love! Nerd love!” Tom Huber (Burning Embers, Earl Brothers) turns in a remarkable instrumental version of the country standard “Home on the Range.” His understated, yet intricate arrangement makes this “Home on the Range” one you really want to listen to. Mick Schaffer‘s down and dirty blues track (produced by Danny Allen of the High Flying Horses) is another highlight. The Tumbleweed Wanderers‘ “Take It Back” provides a nice taste of them performing as an acoustic quartet. The real Tumbleweed Wanderers are an electric 5-piece, with a dead-on three-man front line in Zak Mandel-Romanni, Jeremy Lyon and Robert Fidel. There is a welcoming variety in their California-rooted indie-rock sound, they have great stage chemistry, strong songs, and plenty of well-placed youthful energy. Mandell-Romanni and keyboardist Patrick Monaco both celebrated their 21st birthdays at the band’s Bottom of the Hill EP release party on November 25th, and Lyon, ahem, is past high school. The other twelve songs are there, they don’t cost any extra, and can even be hiding bands like The SHE’S (yep, the capitals are theirs) who could, in fact, come climbing up a musical ladder near you. Home Fires, the newest from Loretta Lynch, draws on the band’s talents for songs about despair (“Someone You Used to Know”, “What Can I Say”), tongue-in-cheek (“Baby Made 1,2,3”, “I Need You”), and tongue-in-cheek songs about despair (“Indicator”, Farewell Party”). They also cover the Ramones’ “I Wanna Be Sedated” and The Ramrods’ hit “Ghost Riders in the Sky” for good measure. There’s no shortage of three-part harmony from Heather Davison, Val Esway and Ari Fellows-Mannion who front this alt-country quintet. In fact, they probably should have varied their arrangements so there’s less three-part harmony throughout Home Fires, but that’s a minor point. The fact is they all write and sing like the three perfect angels they’re not. The Bay Area now has the makings for an entire night of grievous angels in triplicate if a Bootcuts/Loretta Lynch/Yard Sale show ever came together. Eight years in the making, The Real Sippin’ Whiskeys Golden Burley was released just as the band ended its thirteen-year run. They really did play their CD release party and farewell show at Thee Parkside on November 6th. The CD stays true to the band’s peaceful, easy California sound that’s as much wistful folk as country. This is a band that played rarely and never did much to promote itself. There’s no drama to their breakup; it’s just that the members now live too far apart to carry on. Band leader Robbie Thayer, who lives in the Sacramento Valley, plans to join another SacVal band, the Bottom Dwellers. 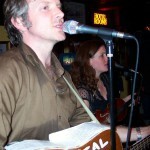 The more lively Bottom Dwellers can give Thayer the punch he needs while he provides them the front-man they’ve needed since their former leader Adam Hancock moved out of state. HWS doesn’t usually review bluegrass or out of towners’ CDs, but there are two that deserve an honorable mention. One is Long Lonesome Day from local bluegrassers Bell Monroe and her Brewglass Boys. This band has never been content with traditional bluegrass, and their willingness to push the bluegrass envelope is their most endearing trait. For example, half a century of overplayed Beatles songs has left most people sick of them. But BMBB pushed right ahead with a bluegrass version of “One after 909” which is one of the few Beatles tunes that hasn’t been done to death. This video of it manifests the band’s unique, higher level of bluegrass consciousness. Texan Lucky Tubb is the nephew of Ernest who had hits like “Walking the Floor over You,” “Waltz across Texas” and “Thanks a Lot.” It’s a nice pedigree to have, but Lucky is his own man, and one with a more up-tempo approach to country than his famous, western swing-minded uncle. He toured through SF on November 19th, playing a very early Saturday night show at the unlikely Brick and Mortar which is better known for Saturday night hip-hop shows. 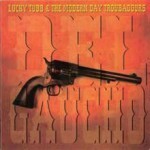 His honky-tonkin’ CD Del Gaucho with The Modern Day Troubadores has been getting too much air time around HWS Central not to tell you about it.